« St Matthias :: the lottery-chosen apostle. They housed massive commercial projectors that in the evenings became the source of Chartres’ electronic fireworks, a festival of ‘Lumières’, light extravaganzas, a digital painting by numbers on over 20 sites and buildings across the city. The idea was simple, the realisation complex, and the effect dramatic. Spell-binding enough to hold the crowds on a drizzly May evening. 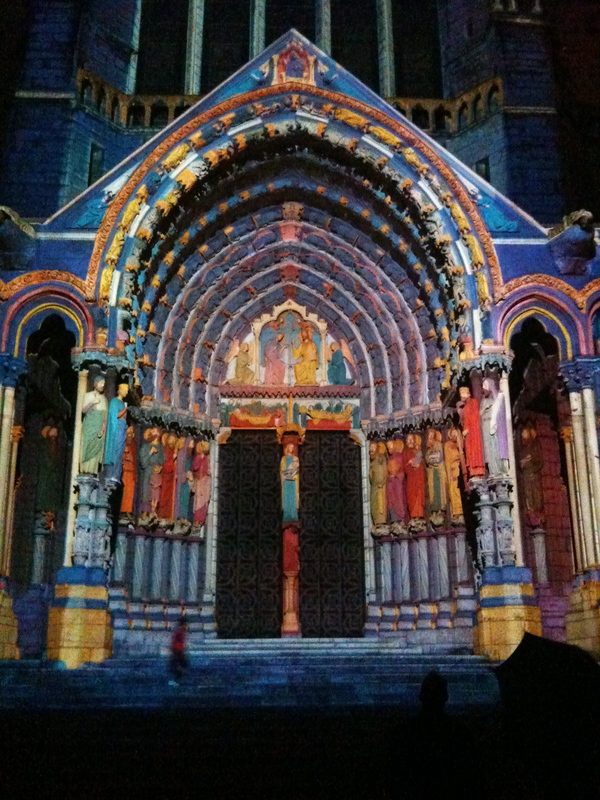 Some of the projection sites were small static spotlights – others huge, complex animated stories, painted across the west face of the cathedral, or the old post house. Some had music accompanying them, the graphics closely following the mood and timing of the music. The static projection of the North Door of the cathedral (image above), at first glance gaudy after seeing the honeyed tones of the carvings evident during the day, were possibly a closer representation of what the carvings looked like in earlier times. Malcolm Miller, Chartres’ vastly knowledgeable if slightly eccentric guide (here seen a few years ago actively demonstrating flying buttresses!) indicated places where the original bright colours still just existed, only visible again after the recent restoration took place. A couple of things before leaving Chartres and it’s cathedral. There is of course it’s world famous labyrinth; which I have written about elsewhere. And then there are the lop-sided spires. Yes, we know most of our faces are not exactly symmetrical; and perhaps it is partly some sort of autistic tendency in me or something – but it is a bit odd. To not even *try* to match. On our recent visit, the repairs to the west wall meant that there was scaffolding all over it, which combined with mediocre weather meant I didn’t get a decent photo (so have borrowed this one instead). The cathedral web site has quite a useful animation showing how it was built. It is as though the two sides of the cathedral have vied with each other over the centuries. Yes we understand subtle differences in symmetry in any major cathedral, with differing statues or stained-glass windows (scroll down here) – but this is quite extreme. It is a statement in stone to ‘vive la differance‘. Truly, another view.